One needs to ask “What is the future of Amateur Radio?” That is, the future of this magazine…. As you read in last month’s issue, the WIA Board is seeking input from you, the member, about your history as an amateur radio operator and your ability to access on-line content. Please do complete the survey (preferably via on-line form or via a hard copy) and return your information and thoughts by the deadline of Monday 14th April. Your input will inform the Directors and assist their deliberations. Hopefully most have examined the sample copy of the March issue via the link from the WIA website. It should give you all an idea of what might be available from the July issue onwards via electronic delivery. That leads to the question of what will be available to those without electronic access? The members of PubCom are very interested in the outcomes from the survey. At present, we are concerned that whatever occurs does not disenfranchise members. To be fully informed, we need ALL members to give us and the Board feedback via the survey. I hear anecdotal evidence that “seniors” are embracing the new technologies. The real question is about how many members can, or cannot, access an electronic form of this magazine? One would expect that most that can access the magazine via electronic means can probably either save the e-magazine in a form for later retrieval and/or print a copy read in hard copy. Of course, it should be possible to ensure that all members can obtain a copy – either via direct electronic access or via some service which provides a hard copy to the member at a nominal cost. As some have pointed out in other forums, it is not that AR magazine is the only benefit of WIA membership. In some respects, this magazine could be considered to be simply the “icing on the cake”. To me, the broader benefits of membership are the advocacy roles undertaken by the WIA at the state, national and international levels that are the most important. Without these representations and advocacy at these levels, one could see that those influencing the legislative bodies could see us (the licensed amateur operators) as a small group of enthusiasts that are being made redundant by the advances in commercial telecommunication technologies. We clearly need to convey to the “powers that be” that we have things to offer to the broader community. This might be in the provision of (or preparedness for) communications when a disaster strikes and the commercial system are overwhelmed. Or it could be as simple as showing that we have a small role in the area of STEM (science, technology, engineering and mathematics) education to our broader community. I am not sure that we (the WIA) have the available resources to actively promote our hobby in the broader sense – that really falls to all of us as individuals and to our local clubs within our local communities. However, there are some relatively easy options…. Are you or your club planning to participate in the PR4AmateurRadio Expo? Did you participate in the John Moyle Field Day contest? Are you a member of WICEN or a similar group? Are you or your club planning to set up a station for the ILLW activity weekend? Participation in such activities can expose our hobby to the broader public, hopefully in a positive manner. We all need to “do our bit” to promote our hobby. So much for the broader philosophical questions. What about your magazine? Our stock of available articles, both “general” and “technical” for publication is rapidly becoming depleted. I often have difficulty to find a reasonable photo to transform into a cover. We need you to consider writing an article about your latest project or activity. We need well composed, high resolution photographs as part of such articles, even if the articles are short. Otherwise, we will all loose local content in our magazine. 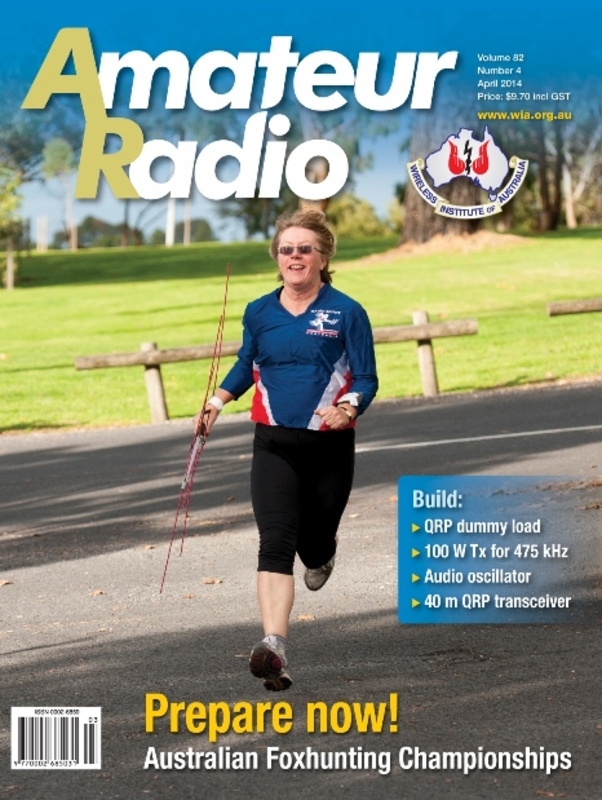 Do we simply move to publishing articles previously published in a sister IARU member society publication, with a number of regular columns and club news contributions? I hope that we do not need to resort to such an approach. As Editor, my preference is publish local content. Okay, it may take a little time for your article to move from receipt through our review system and onto the printed page… But at least it is your contribution, about local (VK) amateur radio activities. So, it is over to you….. The contribution can be short and to the point. It might be a long epistle about a complicated project – but please try to organise such an effort in a way that might be logically split across more than a single article. Always remember – good quality images help us to present you efforts in the best light. The PubCom team looks forward to being overwhelmed by your high quality contributions! Now is the time to plan your final preparations for the Australian Foxhunting Championship, to be held in early June in and around Mount Gambier. The cover shows one of the hounds during last year’s event – Suzanne O’Callaghan VK3FSZI. Read the promotional information on page 21. Photograph by Charles Prime VK5HD. Should amateur repeaters run 120 watts? For many years the WIA Beacon and Repeater Coordinator has handled all issues relating to the frequency allocation and licensing of amateur repeaters. However, just recently, we have received some complaints from amateurs asking why their club’s application for a repeater licence was changed from a proposed power of 120 watts (pY) to 50 watts (pY). Why the discrepancy? And why shouldn’t an amateur repeater be allowed to run the same power as any Advanced licensee? After all, repeaters (and beacons) are licensed under the Advanced LCD. I am told the current amateur repeater frequency allocation and licensing procedure goes back many years, to a time when the ACMA proposed to charge all amateur repeaters the full commercial repeater licence rate, based on the fact that amateur repeaters, especially those located on shared sites with commercial services, required the same amount of frequency coordination work as commercial repeaters. • A repeater licence gives exclusive use of a frequency pair to a comparatively small group of users, and geographic coverage and frequency sharing issues become important, particularly in urban areas on the east coast where clear frequencies are very scarce. Many amateur repeaters are located on co-shared sites with commercial services and issues such as cross-interference and intermodulation are a serious concern. • Restricting repeaters to 50 watts average power ensures that most, if not all, will be Electromagnetic Emissions (EME) Compliance Level 1 and thus compliance requirements are reduced. • Many amateur stations operate into local repeaters from handheld transceivers, so their effective range is restricted by the power of the handheld rather than the repeater’s transmitter power. In general, the WIA believes the limited spectrum available for amateur repeaters should be available to as many groups as possible, and unnecessarily high power and range should be avoided. The WIA has applied that basic spectrum management policy to amateur repeater recommendations for many years, and the policy appears to have had wide support within the amateur community. On occasion, the WIA does recommend repeater power levels up to 120 watts pY in situations where the additional power is shown to be justified, after considering factors such as remoteness and size of the coverage area, local site sharing constraints, and EME effects. So, is the WIA doing the right thing? Should the WIA continue to apply the land mobile standards to most amateur repeater applications, or should we just operate as a “post box” and submit a club’s application requesting a 120 watt power limit? PS - Please don’t forget to fill in the WIA survey in your March AR. If you have internet access, please do it on-line, otherwise copy or tear out the survey from the magazine and send it to the WIA office. Surveys must be received before the closing date, Monday 14th April. This is a short article on the Cooktown Radio Station VIC, which was the scene of a visit from the Tableland Radio Group when they visited the area for the ILLW event recently. As with almost all things historical in Australian radio history, this makes interesting reading. This contribution tells the story of a trip made by two intrepid (they must be!) six metre operators to the small South Pacific entity of Niue E6 for the purpose of some six metre DXing specifically, and HF DXing generally. This project describes how to construct a CW transmitter for the 472 – 479 kHz amateur band without conceding any degradation in performance when compared against many commercial units. Designed and fabricated by one of Australia’s most successful homebrew exponents, this will be a ‘must’ project for all amateurs interested in building their own quality transmitter. This is a well written article about the design and fabrication of a dummy load made from surface mount resistors, and suitable for low power HF operation. The exercise to build this unit may be as useful for the practice it would give the homebrewer in the handling of surface mount parts as for any particular purpose required for the finished unit.